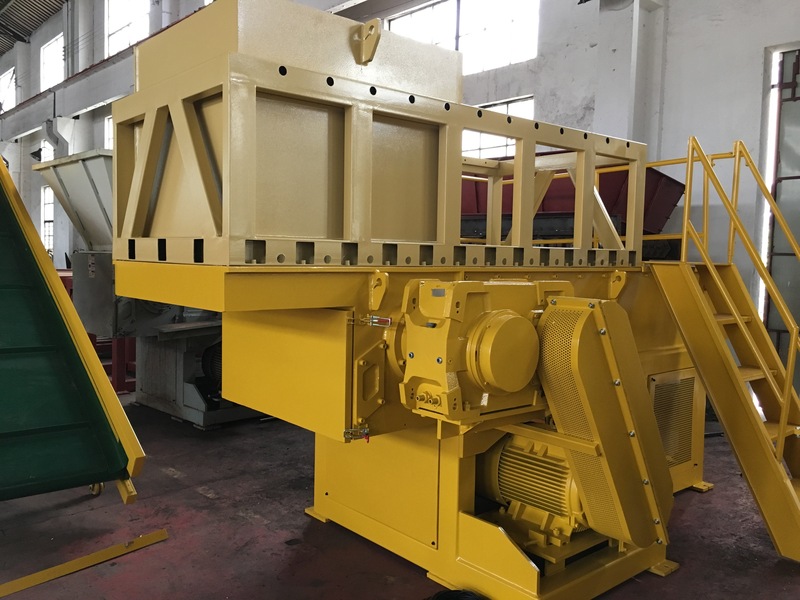 Shredder is used for coarse crushing and is generally used to treat waste materials that can be reused to make them smaller in size. Generally, Shredder can be divided into Single Shaft Shredder, Double Shaft Shredder, Four Shaft Shredder. Shredder is used in a wide range of applications, and most solid waste materials can be used for production and processing. It is applicable to industrial waste recycling, plastic recycling, tire recycling, wood processing, domestic garbage recycling, medical recycling, paper and other industries. Our FGRS series shredder is a special equipment for shredding large-diameter thick-walled pipes. The unique horizontal feed trough and long-stroke pusher are designed to meet the requirements of 3m or 6m length of pipe without the need for sawing. Shredded, designed for pipe design, with PLC control, its appearance is exquisite, durable, shredded is safe and efficient. FGS series shredder is a relatively common type of shredder that can be used to shred hard-to-break plastic, rubber, fiber, paper, wood, electrical components, cables and other solid materials, such as: nozzle material, plastic head, PET bottle, hard Cardboard, circuit boards, wood, plastic barrels, etc. Users can select the appropriate model based on material size and throughput. If the user needs to break the hard material, such as nylon, ABS, PC and other high-strength engineering plastics, please explain the situation. We will adjust the shredder accordingly. When using a shredder, use some tips to increase throughput, reduce energy consumption, and reduce failures. Do not feed the machine for two minutes after starting the machine. Let the equipment idle for two minutes before feeding. Before the shredding work is carried out, the materials to be shredded can be classified and classified, and the materials of the same material size can be divided. The same kind of input can improve the work efficiency and the output will increase. In addition, after the material is finished, all the materials should be discharged before the equipment is turned off, so as to avoid the machine being turned off and the motor burned after the next power-on. After continuous research and improvement by our company, we have designed the granulation scheme according to the actual material conditions of the customers. From the waste raw materials to the finished products, we always adhere to high efficiency, energy saving and stability. Solve problems for customers and achieve mutual benefit and win-win. We draw on foreign advanced equipment technology, visit customers’ factories, listen carefully to customers’ actual operating experience, digest and absorb the advanced concepts of the recycling industry, and combine the actual development of the waste plastics industry to continuously improve the design of equipment components, which can meet the domestic and international recycling plastics industry. Requirements and ability to meet the environmental requirements of the local recycling industry. At the same time, our company also produces plastic recycling washing line, plastic pelletizing machine, and related auxiliary equipment. Our company’s products can meet EU standards, and strictly in accordance with national standards. We always adhere to the concept of high efficiency, stability and energy saving. By tailoring suitable production solutions for our customers, we can help our customers turn waste into treasure, create profits and achieve mutual benefit. The plastic Vertical type Dryer Mixer with heating system produced by our company has many different output, 500kg/h, 1000kg/h, 2000kg/h, 3000kg/h, 4000kg/h, please refer to the detailed parameters. If you have any questions, please don’t hesitate to contact us. We’d like help you and reach win-win situation with you! Zhangjiagang City, Jiangsu Province, China.